not great sportsmanship to build a robot on the premise that inspectors won’t know you’re breaking rules. The last few years to measure extension rules, we would place the robot in front of a wall near the weigh station the distance of the extension rule. If it hits the wall it fails that part of the inspection. I would recommend any team that is anywhere near the 30 inch limit to do this same test before they put the robot in a bag. At least the inspectors got it EARLY. Had a team a couple years back who made it through inspection with a robot that couldn’t get inside its own frame perimeter to start, not sure how, and they showed up to their first match… and ran into questions from the refs, who called the LRI. Didn’t end well. Also, PSA: Judges wear blue polo shirts and don’t care about the rules. Inspectors are the ones enforcing the robot rules and wear yellow hats. Thanks! Second PSA: Can some inspector or other in IN go talk to 7502? Like, tomorrow? Second PSA: Can some inspector or other in IN go talk to 7502 ? Like, tomorrow? yeah, that needs to be taken care of or some feelings are going to get hurt in a few weeks. Just so everyone doesn’t have to look, they are from Middlebury, Indiana, I am not in the area, but if any teams are, please try to connect and make sure they can at least drive and pass inspection, failing inpection due to a basic rule Is not inspiring! I’m nearby (within an hour), what would be the best way to reach out? No info on TBA. Not to speak for them, but I have a feeling 135 might also be able to help, they are much closer, and also the hosts of their first competition. If you only extend it at the end of the match with your bumpers fully in the hab zone then your allowed too. If you plan on extending it during the match then It will be up to the inspectors discretion. I’d recommend you be very friendly with your inspector. No even in the Hab zone it would still be illegal. If you only extend it at the end of the match with your bumpers fully in the hab zone then your allowed too. I hope your team is not planning to do this. There is never a time or place during the game where you can exceed 30"
Q&A answered; hopefully they understand. 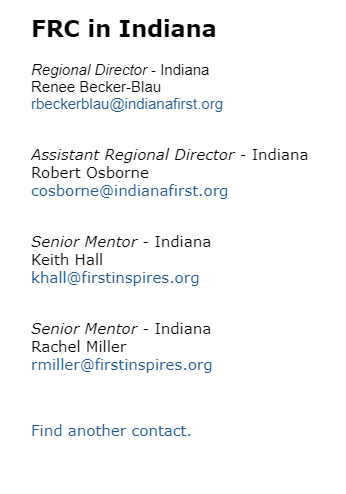 If you email the FRC in Indiana regional director, they should have contact info, and if you explain the scenario I’m sure they would be willing to connect you with the team, also they seem to be connected to Northridge high school, if you call the school they may know the individual directing the FRC team and be able to get them in contact with you. They’re talking like they’re going to START the match outside of their Frame Perimeter but inside the 30". I had a team try that last year, also a rookie, and they ran into the LRI when I flagged him down. But the fouls go on your permanent record. “SARCASM” Please follow the rules. A good start for Al’s 2019 inspection thread. Nothing beyond 30" RE: frame perimeter.